This view shows the various plumbing of the completed air induction system, the charge air system, the air conditioning system, and the coolant and cooling systems. Like other inquisitive young kids that grow up to reshape the world as we see it, Bob Sliwa also began his intimate relationship with science and physics, by disassembling his toys just to see what makes them whiz and whirl. But, when he sat down to design and then create a brand new Class 8 tractor trailer rig with advanced aerodynamics, extraordinary fuel savings, and a very low emissions profile, he ended up revolutionizing over the road trucks. The 2011 AirFlow SuperTruck, the world's biggest hot rod, is scheduled to be rolling by this spring. Sliwa founded the AirFlow Truck Company in 1983 and his vision to substantially lower the cost-per-mile operating cost for fleet operators and owners of rigs, is destined to become reality when he unveils his first working prototype of AirFlow's second-generation design. Sliwa recently agreed to talk with us about what he calls the world's biggest hot rod. Having seen the concept drawings of the truck, we have to say that in comparison, other rigs look like dinosaurs. How and when did this idea come about, was it swirling around in your head first as you drove trucks yourself? "Thanks for the compliment. Actually you got it just right. The idea started swirling around in my head when I first became an owner-operator in 1980. Soon after buying my first cabover tractor 18 wheeler, I then realized how poor the fuel mileage of existing equipment was. So right then, I decided to improve the efficiency and the fuel mileage, using my prior drag racing experience." 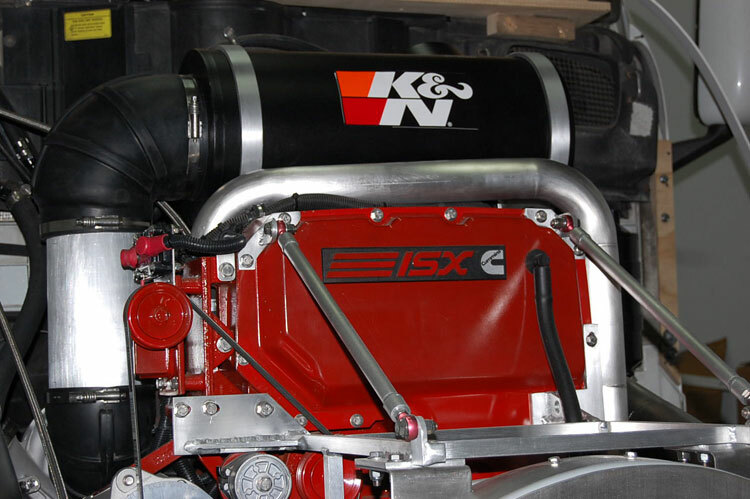 Shown here on top of the Cummins ISX is the new air induction system, and the new Heavy Duty Air Filter assembly from K&N Filters. At first glance your truck resembles a European/Asian Bullet train somewhat, how did you come up with the "airflow" design and how much wind-tunnel testing was done, and what sort of measurable drag and fuel reductions do your results indicate? "The current AirFlow 2011 SuperTruck design is actually a morphing of a Kenworth T2000 truck, into a more aerodynamic design, as opposed to starting with a "clean sheet" design. So many design compromises had to be made. It would have taken many more years, and tens or hundreds of thousands of dollars more, to do a clean-sheet prototype." 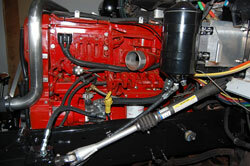 Here is a close-up shot of the detail on the left side of the Cummins ISX. "We had great help with the SuperTruck design from our CAD and CFD designer, Jeremy Singley, of Jeremy Singley Industrial Design. The AirFlow rig has never been out on the road yet, so we have not done any actual wind-tunnel testing. All of our aerodynamic testing has been done via computer with software provided by one of our Partners, SolidWorks. SolidWorks provided the Computational Fluid Dynamics (CFD) FloWorks software that we use to tweak the aerodynamics. The CFD software is analogous to a virtual wind tunnel. Our FloWorks CFD software says we have 326 lb ft of drag, which is a 45% drag reduction over a stock Kenworth T2000 pulling a stock trailer. This translates to an approximate 25% fuel savings." In general terms, just how much research has gone into the overall concept, and have you found that it continues to evolve as you get further into the development? "The research has been ongoing and evolving to some extent for over 25 years now. I always knew I wanted to build what is called a 'conventional' tractor, as opposed to a 'cabover' tractor. The basic difference is that a conventional tractor has the engine in front of the driver's compartment, and in a cabover, the drivers compartment sits over the engine. We have only ramped up research and development in the last two years with this new project and the prototype. Yes, the design and the details do evolve daily. When we add one new piece it sometimes affects many other pieces of the puzzle. Oops! I mean the prototype." How many people are currently working on the project with you? On a day-by-day basis, it is usually just myself, as a one-man project. My best friend helps out with the actual build on some Saturdays. And our CAD/CFD designer works on CAD details, or aerodynamic tweaks, on contract assignments for us. But, I estimate that I have done 98% of the work of the AirFlow Truck project myself. From contacting sponsors, administering the web site, buying parts, building custom parts, and the actual prototype truck build itself. Six days a week for the past two years. Are you aware of any other truck design projects along the same lines as yours? "Not to this extent, at least, none that I am aware of. Many OEM's are trying to get better fuel mileage and lower emissions through various, and what I consider questionable, techniques. But basically, I feel that the large truck OEM's are at least 30 or 40 years behind the times with their designs, even though they all check out the AirFlow Truck web site on a regular basis. Volvo Truck North America has been to the AirFlow Truck web site over 100 times in the past two days alone." Tell us a bit about the engine design and how did you decide to go with the K&N intake? "Other than the redesigned cooling system and drive belt system, and the custom implementation of the new K&N Heavy Duty Washable Air Filter, the engine is basically a stock Cummins ISX 450 horsepower diesel engine." "We have done some modifications to the ISX to reduce parasitic horsepower losses. These include removing the belt-driven A/C compressor and installing an all-electric A/C compressor, removing the 40# cooling fan hub, and adding 45 quarts of 5W40 synthetic motor oil." "Being a former amateur drag racer, I have been familiar with K&N Filters, and their sterling reputation for quality products, for over 40 years. So when K&N recently introduced their new K&N Heavy Duty Washable Air Filter, and when K&N told me it has lower restriction than the OEM filter, I knew we had to have one for the project." Are you finding a lot of support for your concept from the trucking industry and other truckers? "We have received overwhelming support from truck component and equipment manufacturers, especially the ones who have a newer version of technology than previous versions of the same component." "We have over 20 corporate partners, and without their magnanimous support, we could not have even begun a project of this scope and magnitude. Again, the prototype has never been out on the road. But I would imagine that the old-school truckers will not appreciate the design and would rather actually drive, or own a square truck. The businessman truckers, the ones who are in it to make money and not just interested in buying shiny chrome do-dad add-ons, will appreciate the design. They will also appreciate how much fuel and money it saves." Ideally, how would you see this project playing out, meaning would you like to go into full-scale production? Also, have you given any thought to developing particular components of your truck to increase the efficiency of existing rigs, such as creating bolt-on airflow body parts or engine components? Unless we are able to obtain adequate funding, this will be the only version of the AirFlow tractor. You hit the nail on the head when you said 'developing particular components of your truck to increase the efficiency of existing rigs, such as creating bolt-on airflow body parts or engine components.' That is exactly what we have in mind. Specifically, trailer skirts, which have now been required by CARB. Although just in case funding is available, we have already designed a 2015 next-generation of the AirFlow rig, and we actually have a 29" long plastic model of it."